The managing director of a local media group is to retire following its recent takeover by publishing giant Newsquest. David Faulkner, left, will step down from his role as MD at NWN Media at the end of the month after 40 years in regional publishing. David, who has spent eight years with NWN, will continue to work for Newsquest on a freelance basis to help the company develop its contract printing business. Nick Fellows, managing director of Newsquest North West, will take over management responsibility for NWN Media after David’s retirement. However, NWN title Hereford Ad Mag will now report to Newsquest Midlands South MD Julia Lancett. David initially intended to retire in 2012, but instead stayed on after an abortive attempt by the then NWN board to sell a controlling stake in the business to Sir Ray Tindle was blocked by a High Court ruling. 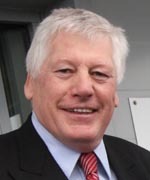 In an announcement to staff, which has been seen by HTFP, Newsquest chief executive Henry Faure Walker said: “David Faulkner has decided to retire from his position as managing director of NWN Media (NWN). “David has had a formidable career in regional publishing over the past 40 years, including the last 8 years leading NWN, and I am sure you will join me in wishing him well for the future. “I am pleased that David has agreed to carry on working for us on a freelance basis to help further develop our contract printing business. “Effective 30 October, Nick Fellows, managing director of Newsquest North West, will be taking over management responsibility for NWN Media, reporting directly into me. Got to be one of the best managing directors I’ve ever worked with. Superb operator, steady hand, calm in a storm. Just the sort of person you need around you in good times and bad.